Even during a season filled with broken records, awards and accolades, you are still bound to hit a bump in the road every now and then, and one of those times is now for the Saints. A tough home stand followed by an even tougher trip north of the border has the team now sitting three games back of the Winnipeg Goldeyes in the North Division. Let’s recap, and look ahead. Starting the latest home stand was a four-game series versus the Sioux Falls Canaries. Normally when the term “sweep” is used in my stories it is referring to the Saints, but not this time. For the first time in CHS Field history the Saints were swept at home, and for the first time in franchise history the Canaries swept a series visiting St. Paul. Every game of the series was tied going into the seventh inning. The Saints must have known the Twins Daily group was in attendance for the first game of the series against the Redhawks, winning in dramatic fashion with a solo walk-off home run by outfielder, Kes Carter. Carter, who was recently signed, hit the shot off his former team two weeks after they released him. Man, I love walk-offs. Saturday night saw an offensive explosion by both teams, ending in a 17-15 eleven inning loss for the home team in an 4 hour, 22 minute marathon of a game. In the final game in St. Paul Fargo defeated the Saints 4-0, winning the series. The loss marked the first time the Saints have been shut out this season. As mentioned above, Friday was the Twins Daily Saints game outing and after-party. Once again, John and everybody put on a great event, and even topped it off with a Saints win. Starting with a pregame picnic and ending at Tin Whiskers, it was a great night. Thanks! Following the home stand the Saints hopped on their bus to Winnipeg for a three-game stop versus the Goldeyes, the team with which they were tied for first place in the North. Unfortunately for the Saints, Winnipeg apparently doesn’t care much for tourists, as the Goldeyes swept the Saints, taking a three-game lead in the division. The Saints now have an overall record of 31-27 and are three games back in the division and two and a half out of the wildcard playoff spot. 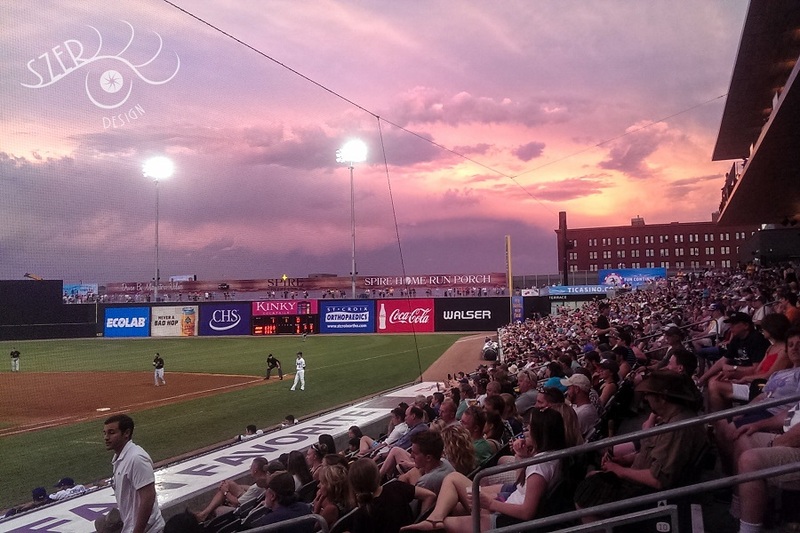 The Saints return to CHS Field for a quick three game series versus the Salina Stockade starting Friday, July 21st. Then, after two days off for the All-Star break, they play an even quicker two-game home set against the Sioux City Explorers starting Wednesday, July 26th. Promotions for the upcoming home stand include a salute to Mystery Science Theater 3000 (July 22nd), Pigs Eye replica jersey giveaway (July 23rd), and JD Drew Silver Season bobblehead giveaway (July 26th). I was at the game on Sunday and the Saints left 10 runners on base. I think they were tired from Saturday's game. I've had a chance to watch both the Lincoln Saltdogs and Winnipeg Goldeyes this season and they have good teams. Wish I could get to more games this summer but the road construction and traffic is impeding my path to CHS Field, ugh! These guys in the indy leagues are some of the hardest working players in the game, especially the ones on the field. There is not a lot of roster movement and the playing conditions (and clubhouses) aren't always the best, unless YOU ARE a Saint and have some pretty comfy digs. It's 3 hours of being on the field or on the bench. And I love it, especially in Saints land!